Violinist Mikhail Simonyan will give his New York Philharmonic debut – a rather big deal for anyone – in just a few weeks. But weighing equally on his mind is a project close to his heart, an initiative he started called "Beethoven, Not Bullets," to support efforts to bring music education – and for that matter, music itself – to the children of Afghanistan. Simonyan will play the Tchaikovsky Concerto with the New York Philharmonic in a series of concerts called From Russia With Love, June 29 and 30 at Avery Fisher Hall. On Monday, though, he will share the stage with New York Phil musicians in a concert at City Winery sponsored by Music Unites, with the aim of raising money to support 50 students in their first year of study at the Afghanistan National Institute of Music (ANIM), at a cost of $360 per student. "It's not like we're trying to persuade them to be more involved in music, we're really starting the musical education from scratch," Simonyan said of the effort to bring music education to Afghanistan. "People there don't know anything about it. It's not like they don't want to know – music was prohibited. You could have been killed if they found you with a recording of a Mozart violin concerto." Afghanistan National Institute of Music is Afghanistan's only music school, run since 2007 by Dr. Ahmad Sarmast, a native Afghan who studied music at Monash University, Australia, and Moscow State Conservatory. The money raised by Simonyan's initiative will cover tuition for general and music education at the school and also provide a stipend for families, who in many cases were dependent on their children working in the streets to support them. Simonyan, 24, started out with the intention of giving concerts for the U.S. Armed Forces in Afghanistan. "My initial idea was to go to Afghanistan and give a concert for the troops. And you might ask, 'Why would you want to go to a war zone?'" Simonyan said. "My brother was a lieutenant in the Russian Army, and he fought in Chechnya, when there was a war between Russian and Chechnya. I also have a lot of friends who played concerts for the Soviet troops who came to Afghanistan when there was a war between the Soviets and the Afghans. From the stories they were telling me, I could see how much it really helped the soldiers. I really wanted to do the same thing." Unfortunately, after exploring the idea with U.S. government officials, they concluded that it would be too risky at this time. "Then a very good friend of mine sent me an article about this Afghanistan National Institute of Music and everything that Dr. Ahmad Sarmast was doing over there," Simonyan said. "I read about it, and I really identified with it." 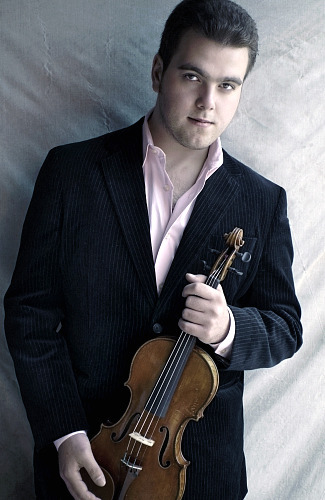 Simonyan was born in 1985 in Novosibirsk, Russia, the same city where violinists Maxim Vengerov and Vadim Repin grew up. The city was then part of the Soviet Union, which collapsed just six years later. "In the Soviet Union, if you think about it, everybody was just fine," Simonyan said. "Everybody had the same salary, the same clothes, the same shoes, same furniture, and so they had some kind of stability. When the Soviet Union collapsed, nobody had jobs, nobody had money; it was just a disaster." "I was growing up in a country that was pretty much rebuilding itself," Simonyan said. "There was a regime there for 70 years which collapsed overnight," and the country lost much of its cultural support as a result. By the time Simonyan was ready to study violin, "all the greatest teachers had left, the orchestras were without any funding, conservatories were without funding. I know what is it to be a beginner musician in a country which is rebuilding itself." "Afghanistan is a bit of a different situation than other third-world countries, like Iraq or Iran," Simonyan said. "Iraq, for example, has a youth orchestra; Iran has a bona-fide philharmonic. In Afghanistan, Western music was prohibited by the Taliban regime for over two decades, so we're really rebuilding the history." Simonyan will go to Afghanistan for the first time in July, when he will visit the institute in person and get a feel for what the students do on a day-to-day basis. "The key to success for every country which is rebuilding itself, is the education of the next generation," Simonyan said. "The idea of 'Beethoven, Not Bullets,' is to try to raise as much funding as possible to support more students. We're giving them the tools; we're giving them the opportunity; we're giving them the inspiration, and hopefully we're giving them something to do in life. Because what have these children been seeing all their lives? Shooting, dead bodies, screaming, tragedies, you name it. They've never seen music. And so we're giving them an idea that a completely different world exists." He also hopes that music will bring some healing. "The children in the school not only are learning the Western music but also they're learning their own Afghan music," Simonyan said. "Their music actually goes much further than Beethoven and Mozart, they have one of the richest and oldest cultures. Countries just cannot exist without any culture." Mikhail comes from a family of non-musicians, and he started the violin at age four, after seeing someone playing the violin on T.V. "I was fascinated by that, and I told my mother that that's what I wanted," Simonyan said. "So she took me to the music school." "Believe it or not, I was not accepted in the beginning!" he said, laughing. As the very young Simonyan walked down the long hall at the music school where he was about to take his entrance exam, he heard trumpets, piano, violin and flute. "I was so fascinated by all the sound that I became completely disorganized. When they asked me to clap four times I clapped three times. They said that my future was not in music." So much for that! One of the teachers took him as a private student, and before long, he was working with conductors such as Arnold Katz, touring and winning competitions. When he was 13, he toured as a soloist with the American Russian Young Artists Orchestra, playing the Szymanowski Concerto in places like New York's Lincoln Center. "And after a very successful tour, the idea came to study here in the U.S. For my family it was sort of a shocking decision," Simonyan said. "Usually, the way it worked was that if you were talented enough, you would probably move to Moscow or St. Petersburg, or at maximum, Germany. The trip to America was a big deal for my family, but we did it, me and my mother, when I was 14. Simonyan came to study at Curtis Institute with Victor Danchenko, with whom he continues to study. Danchenko was a student of the great Russian violinist, David Oistrakh, and in a way, Simonyan had landed halfway across the globe just to find that connection with his own culture. "I definitely chose Curtis because of (Danchenko)," Simonyan said. "He is probably one of the few teachers here in American who really knows the Soviet and the Russian culture very well. And of course, David Oistrakh was an incredible man, an incredible artist and an incredible musician. I really wanted to know him better through Danchenko. Learning two Prokofiev Sonatas, which were written for Oistrakh – has made all the difference in the world. Or practicing the Shostakovich Violin Concerto or the Prokofiev Violin Concerto. Danchenko was the perfect candidate for what I needed." Simonyan recently released a recording of Sergei Prokofiev's Sonata No. 1 in F major and Sonata No. 2 in D major. When it came to working on pieces like these, Danchenko passed along "the mood of that time, what it was like to be living in the Soviet Union at that time, what it was like when Prokofiev wrote his first violin sonata. All of that was a big help to me. It's not like I concentrate only on Russian music, but Danchenko was really the perfect man to learn the Russian music with." Simonyan has a 1769 Giuseppe Gagliano violin, but it's not what he'll be playing for his New York Philharmonic debut. "I'll be playing a violin which was made especially for me by one of my greatest friends, Christophe Landon," Simonyan said. "The violin that he made works much better for me than a Gagliano violin. It has more resistance, it's much faster, and it has much more projection to it. It has a bigger tone to it. It's a copy of 1730 Stradivarius "Wilmount." And I even played the original at Windsor Castle, and the violin that (Landon) made worked better for me than the original Strad! Very fascinating. "By the way, 85 percent of Strads do not sound good. They're so over-worked," Simonyan said. "It's a very rare thing that you find an amazing Strad. But then if you do, you put a price tag of $11 million on it. So what's the point?" "I've tried a lot of great Strads and del Gesus and everything, but there are only a few violins that I would really play on. Right now the violin that I use from Christophe, it works for me," Simonyan said. "If anybody thinks I'm joking, come to my New York Philharmonic concert!" he said, laughing. A beautiful rendition, I do appreciate his artistry and feeling for the music of Sibelius. The conditions in his country will make his contributions and outreach even more significant. This is even more interesting! It really prooves the saying that it's not the violin that makes the good sound, it's the violinist! I mean strad or not, it really doesn't matter with good caliber players. He is doing such a wonderful thing by bringing music to kids who have grown up with war. The music should bring some joy, and restoration of the spirit for these lucky kids. I know that he has immense bureaucratic, political, and tactical obstacles to overcome, as well as the dedication to accomplish his goal. Thanks, Laurie, for bringing this uplifting story to us. I had never heard the Sibelius piece before, but now I love it.